At long last, the National Strategic Special Zones are set to get off the ground from the current year. Minoru Sasaki, the journalist who shed light on the true picture of Heizo Takenaka in his book Shijo to Kenryoku [Markets and Power] (Kodansha), is now sounding an alarm that, with the passage of the National Strategic Special Zones Law and the launch of the Special Zone Advisory Council, a scheme will come into force under which structural reformists will seize control of policymaking. To learn more about the dangers of these special zones, GEKKAN NIPPON sat down for an interview with Mr. Sasaki. GEKKAN NIPPON: Heizo Takenaka has been installed as a civilian member of the Special Zone Advisory Council. 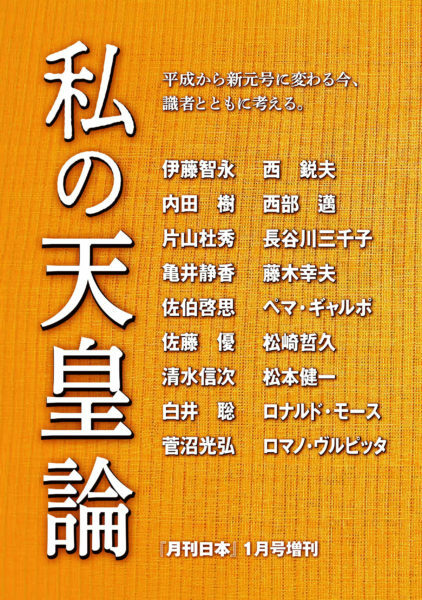 Building the world’s most business-friendly environment, a paper prepared by Yoshitaka Shindo (Minister in Charge of Regional Revitalization) for that May 10 gathering, was clearly based on the assertions made by Takenaka. Shinto proposed the creation of special zones of a totally different dimension than those in the past, while making express mention of the formation of a powerful implementation structure under the leadership of the Prime Minister, the introduction of an advisory council headed up by the Prime Minister with participation by civilian members and other ideas. As a reference, Shindo expressly attached to the materials that he prepared for this occasion Takenaka’s “Abenomics Strategic Special Zones” concept. The Takenaka group has steadily advanced the special zones concept. Becoming a member of the working group was Eiji Hara, former Ministry of International Trade and Industry bureaucrat and a figure serving as an aide to Minister of State in Charge of Administrative Reform Yoshimi Watanabe in 2007 in the cabinets of Shinzo Abe and Yasuo Fukuda. 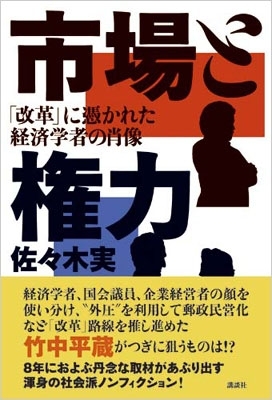 Hara retired from government service in 2009, and joined with Takenaka brain Yoichi Takahashi to establish the Public Policy Planning & Consulting Co. Hara personally speaks of how he serves Takenaka in a support capacity. Takenaka, Hara and Takahashi, incidentally, all supported Toru Hashimoto, Osaka City Mayor and representative of the Japan Restoration Party. NIPPON: The National Strategic Special Zone Advisory Council also overlaps with the image of the Council on Economy and Fiscal Policy (CEFP) led by Takenaka during the Koizumi administrations. SASAKI: It is important to note the high legal positioning of the Special Zone Advisory Council. Within the Cabinet Office, important policy councils are placed with the purpose of contributing to the planning, formulation and integrated coordination necessary for the various administrative agencies to advance uniform measures on important policies. These are extremely highly ranked councils, and m fact include only four bodies – the CEFP, the Council for Science and Technology Policy, the Central Disaster Prevention Council and the Council for Gender Equality. On December 7 the National Strategic Special Zones Law was passed, with the Special Zone Advisory Council added to the ranks of these important policy councils. NIPPON: Mention of “special zones” gives the impression of being active in limited regions for limited periods of time. The National Strategic Special Zone Advisory Council, however, has the potential to become a permanent body. SASAKI: That’s correct. The ICC is not a council positioned so high from a legal perspective. In contrast, the Special Zone Advisory Council is legally supported as an extremely important council, and definitely has a different standing. Soon after the inauguration of the second Abe administration, Prime Minister Abe attempted to install Takenaka as a member of the CEFP, but failed in that attempt due to opposition from Deputy Prime Minister Taro Aso. Consequently, Takenaka ended up a member of the ICC, which he used as a launching pad to promote the special zone vision. Ultimately, he was made a member of the Special Zone Advisory Council—a body on equal footing with the CEFP. With that, the resurgence of Takenaka emerged as a shining success story. NIPPON: The creation of the Special Zone Advisory Council as a staging ground is a major problem in itself. SASAKI: As long as the staging mechanism itself is in place, numerous entities can be included in the mix. The scene has been set for the promotion of all brands of regulatory reform on the force of powerful authority. Examining how the CEFP operated during the time that Takenaka held sway as the minister in charge, we can forecast the movements of the Special Zone Advisory Council as well. The thinking is that, at the end of the day, even if ministers of the ministries in charge are opposed, a majority vote by the council spells victory. This is the approach, in short, of always having the civilian members band together in the same assertions to secure a majority. What’s more, the National Strategic Special Zones Law makes some truly startling declarations regarding membership in the advisory council. Presented in Article 33, as the requirements for individuals to become council members, in addition to designating the Chief Cabinet Secretary, the minister in charge of special zones and ministers of state appointed by the Prime Minister, the following determination is made: “Persons possessing exceptional knowledge with regard to strengthening the international competitiveness of industry and forming bases for international economic activity through promotion of structural reform in the economic society.” In essence, this means it is only possible for structural reformists to become civilian members of the council. Properly speaking, the members of an advisory council consigned with the work of deliberating important national issues should comprise a diversified range of individuals. The deck has been stacked, so to speak, so that discussions can only move in the direction of promoting structural reform. Along with Takenaka, civilian members selected for the advisory council this time around have been Komatsu Ltd. Councilor and Senior Advisor Masahiro Sakane, Boston Consulting Group Partner Reiko Akiike, University of Tokyo Professor Ken Sakamura and Osaka University Special Visiting Professor Tatsuo Hatta. It will be important to scrutinize the movements of these members from this perspective. NIPPON: At the October 21 meeting of the Lower House Budget Committee, Policy Research Council Deputy Chairman Yasuhisa Shiozaki of the Liberal Democratic Party posed the question of whether ministers in charge, who might become so-called “resistance ministers,” would be summoned to the Special Zone Advisory Council. Prime Minister Abe responded with the announcement of the policy to remove ministers in charge from the decision-making process. SASAKI: This is truly maneuvering aimed to have only structural reformists determine the nation’s principal policies. Last year, the Special Zone Working Group set its sights on regulatory reform positioned to facilitate dismissals based upon the clarification of conditions, procedures and other details in advance labor-management agreements. Pushing back, however, was the Ministry of Health, Labor and Welfare, citing the grounds: “It would be unacceptable for laws guaranteeing the rights of workers to not be applied in certain specific regions. This would also likely infringe upon the Constitution.” Such a stance reflects concerns that failure to add the Ministry of Health, Labor and Welfare to the decision-making process of the Special Zone Advisory Council runs the risk of creating means of easily opting for regulatory reform extending all the way through to the domain of dismissal special zones. Diet members should have raised their voices to a greater degree prior to passage of the Special Zone Law. This is because moves are afoot to arrange for important issues—matters that these members should originally deliberate themselves—to be determined exclusively by the advisory council. NIPPON: In response to solicitation of proposals concerning National Strategic Special Zones, applications were received from 244 groups. Of that total, however, local public entities accounted for only 61 groups, with 181 of the groups comprised of private companies and other bodies. At the “intensive interviews” conducted with experts in July 2013, Morgan Stanley MUFG Securities Chief Economist Robert Feldman presented a massive list of proposals for regulatory reform. SASAKI: In other words, efforts are ongoing to determine the nation’s institutions not by National Diet members, the people’s representatives, but rather by economists from foreign-owned securities companies. A certain group of people, championing the interests of global companies, are passing themselves off as the “representatives of the Japanese people” in seeking to alter Japan’s systems to serve their own ends. At the ICC, Lawson, Inc. CEO Takeshi Niinami has already proposed elimination of Japan’s rice-growing acreage reduction program. The problem with this is that moves are being advanced to take action on such rice acreage reduction, an issue that begs to be deliberated by the general public from various different perspectives, by persons lacking knowledge of the actual situation in the fields and in the absence of anyone involved with agriculture. In the much the same way, attempts are likewise being made to advance discussions of health care without including persons from medical associations. NIPPON: So doesn’t this mean that it is the structural reformists who are the true stakeholders? SASAKI: While Takenaka typically goes by the title of Keio University professor, he is in fact chairman of the Pasona Group—the temporary staffing service. With the special zone concept extolling “utilization of the private sector staffing business,” it seems logical for this to be censured as pork-barrel politics. Yet, Yoshihiko Miyauchi of Orix Corp., and more recently Hiroshi Mikitani of Rakuten, Inc. and other leaders of companies that stand to benefit from regulatory reform are openly signing on as members of conferences concerned with regulatory reform. That tendency is coming to be accepted as the natural state of affairs. There is even a sense that such corporate figures are turning defiant in their stances, citing the rationale: “Our own company will profit from regulatory reform, and as a result the Japanese economy will also benefit. What could possibly be wrong with that formula?” In the past, moves to expand corporate profits involved turning to Diet lawmakers in attempts to change policy. While this frequently prompted cases of bribery and corruption, the current situation finds members of the structural reform camp working to determine policy matters in positions higher than legislators. In that sense, it can also be said that the need for bribery has been phased out. 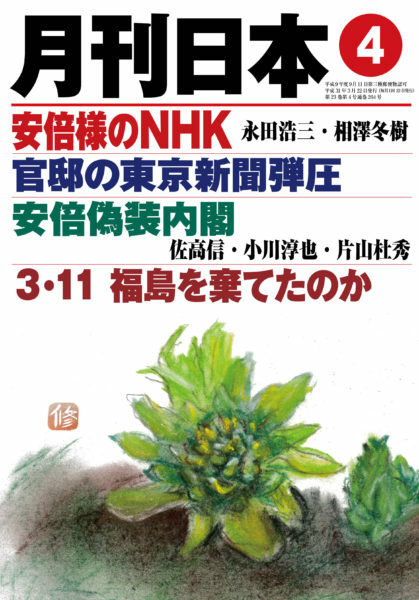 NIPPON: The structural reform of the Koizumi administrations produced various harmful effects. Even when conceding to the promotion of regulatory reform, therefore, extending discussions to the impact that such moves will have on society should be the natural matter of course. SASAKI: It has already reached the point where the issues of society no longer even come into these people’s field of vision. This is the philosophy that, in the quest to “create the world’s most business-friendly environment,” it doesn’t matter if national livelihoods are shattered, the gaps in society widen or other evils come to pass. What we need to pay attention to is the fact that, among regulatory reform proponents, there is a certain degree of logical consistency. The Abe administration has proposed a growth strategy as his third arrow of economic recovery, coming out in support of strengthened industrial competitiveness. Based on that, the “creation of the world’s most business-friendly environment” will be featured in the push to attract overseas companies. Bold regulatory reform is key for success on that front. NIPPON: They like to point out Singapore as a model to emulate. But is Singapore really suitable as a national model to be pursued by Japan? Questions need to be raised about whether simply becoming a business-friendly country is acceptable as a goal. SASAKI: What the US is demanding is not special zones implemented by gathering opinions from the bottom up, but rather zones that will be forcefully promoted in the top-down formula. This is naturally because that makes it easy to reflect US intentions. Then, formulating the top-down approach of having a small number of members on an advisory council determine issues under the leadership of the Prime Minister, was the Takenaka group. NIPPON: Within the special zones, how will regulatory reform be specifically carried out? SASAKI: The Feldman proposal contains areas extremely dangerous for Japanese society. For example: “Easing of dismissal regulations for companies introducing outside board members.” Under that concept, reformists would be able to freely dismiss personnel as long as they personally become corporate directors. Feldman is championing truly astonishingly self-centered ideas, with his proposals extremely concrete in nature. For instance, the concept of “integrating illness classifications with the US and other countries.” This refers essentially to treating US and Japan medical service fees in the same fashion. As another proposal: “Early introduction of the personal number system in the medical service field.” These particular measures comprise regulatory reform geared to facilitate entries into the Japan market by foreign-owned hospitals. If the advisory council adopts such schemes, receiving subsequent cabinet approval will clear the way for an immediate move to implementation. On the same day of the interview with Feldman, Naohiro Yashiro, Visiting Professor of the International Christian University’s College of Liberal Arts, also proposed reforms in monetary compensation for dismissal and other workplace rules. In September 2006, directly before the Liberal Democratic Party held its presidential election to decide Koizumi’s successor, Takenaka presided over a study session for Abe. Among the participants in that meeting were Feldman, Hiroko Ota and Yashiro. The seats supposedly occupied by the “people’s representatives,” in other words, were dominated by persons of this ilk. NIPPON: Hidehiro Kikuchi points out that, in much the same way that Shanghai came to be settled by the Western powers in the past, the special zones will come to be conceded to foreign capital. SASAKI: If special zones are set up in Tokyo, Osaka, Nagoya and other major cities, the outcome will not end at mere concession as such. It is clear, rather, that the rules of these metropolises will become the standard and then expand nationwide. NIPPON: In the annual reform demand paper as well, it is effectively stated: “The measures succeeding at the special zones will be applied on a nationwide scale as soon as possible.” The civilian members of the advisory council, in other words, are issuing arbitrary judgments on whether or not the initiatives will succeed. SASAKI: That’s problematic. In the event of expanded participation by foreign capital within special zones fueled by regulatory reform, the results will be assessed as being “successful” even if problems of a social nature crop up. There is a need to meticulously monitor what types of regulatory reform are advanced at the special zones. The Takenaka-led group is a band of institutional design professionals whose ranks include former economic bureaucrats. To mount resistance to this force will require becoming literate in the field of institution building. If we assume that efforts are being advanced to set up a scheme to effectively disregard people’s lives and pursue the interests of global companies alone, then we will need to stay ahead of the game in cultivating the literacy needed to see through what exactly these people have in mind.